British Black Metal throwbacks A Forest Of Stars here present their second album, moving away from the naturalist single-word song titles of their debut but making only improving changes to what is a good formula. They have taken their rather twee Victorian image and made more of it this time with the cover art and song titles, though. Fortunately, this isn't just a rehash of the first album, either; the band have definitely moved forward in terms of the music they are making, although at over seventy minutes long this album will, again, test the patience of those that require their music in more manageable chunks. They’d be missing out, however, as there is much improved here. The rough edges of before have been smoothed out, and subtlety is as much at hand as blastbeats and harsh vocals – as the first clatter of opening track Sorrow’s Impetus fades in, what strikes you most are the keyboards, very solemn and eerie behind the raw black metal attack. Moving to tribal percussion and an almost chamber-music style of melody, the song fades to mere flute, King Crimson-like in its embrace of near-ambience and chaotic noise next to each other. And make no mistake, despite the fuzzy image, the band are quite capable of blasting out the jams. In some ways they’re like a very low-fi Drudkh (early period, not underrated latter day post-black!) with less melody and more intense blasting, although one of the great things about A Forest Of Stars is the sense of genuine originality that you feel when listening. It’s like you’ve just found this album in a dusty attic, buried since the 1800s... pigeonholing them into an exact subgenre doesn’t matter. What does matter is how well this album flows, how hypnotic and compelling it is that you barely notice where one song ends and another starts. Experiments like Eastern melodies and rhythms (Raven’s Eye View) are worked so well into the track’s overarching narrative that they are not so much highlights as spots of colour in a painting, easy to focus on but part of a bigger picture. Lugubrum-like, the bass is easily audible and the gruff lead male vocals form a deranged bellow that can sometimes distract attention from the coldly sane music beneath. It’s when the band allow the unaccompanied music-hall piano of Summertide’s Approach, however, that you really sit up and take notice, and the ensuing glorious, almost post-rock build-up is quite spectacular. Nothing on the album, before or after, really matches it. The cranky see-saw of Thunder’s Cannonade, moving between screeching violin and angry screeches from vocalist Mister Curse, falls shortest. It’s made up for by the following Starfire’s Memory, however, rather grim and gloomy even with female vocals, and wigging out wonderfully at the end with those spacey keyboards. I’ve learnt to appreciate this sort of music again after some time spent away from it, and I can see why my self from a few months ago would have found it deeply boring. The last track, the sixteen minute Delay’s Progression, is very drawn-out, female whispers and gentle synth doing their near-ambient thing for several minutes before the first riffs – yet now I find it rather spookily effective, and even the vocoder-style vocals work rather well in this deliberately aged setting. It all depends on your level of patience with this kind of black metal, when all is said and done. Mysterious and decrepit, melodic and melancholic, A Forest Of Stars have their own take on the genre, and do so damn well. 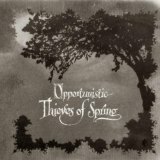 Opportunistic Thieves Of Spring is more than worthy of your attention.